Pour entire Grout Shield contents into a clean mixing bucket. Slowly add the entire bag of sanded grout and thoroughly mix (drill, grout mixing bit & bucket). Let sit in mixing bucket for 10 minutes and then mix again. Follow the grout manufacturer’s instructions to install grout. In order to maintain color consistency across an entire installation, use the same liquid to grout proportions when using multiple containers for the same job. Inspect and rework grout joints if necessary during final cleaning. (Between 45 – 60 minutes). Note: Some tile professionals may desire a particular grout consistency. 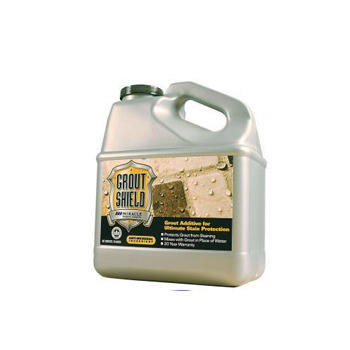 In this case, once the recommended Grout Shield has been used, up to 2 ounces of clean cool water can be added at a time until the desired consistency is achieved. Special Notes: When using Grout Shield stain resistant grout additive, grout doesn’t need to be sealed. If tile or stone needs to be sealed, do so before grouting with Miracle Sealants 511 Impregnator or Superseal (compatible with Grout Shield) as your grout release. Avoid applying sealer to tile/stone edges as this may interfere with proper grout bond. If enhancing tile and/or grout, use Miracle Sealants Seal & Enhance as your grout release. Do not use Grout Shield additive with cement grouts that already claim stain resistance, or with liquid, ready-to-use or epoxy grouts. Certain tile surfaces, including glazed ceramic tile, marble, stone and agglomerate tile can be scratched, stained or damaged when grouted with sanded/colored grout. Follow tile manufacturer/fabricator recommendations and test a small area prior to use to determine suitability. Not recommended for installations where chemical resistance is required. 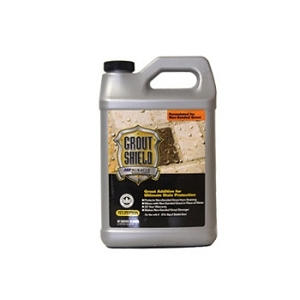 Never mix Grout Shield additive with latex additive or any other additives.